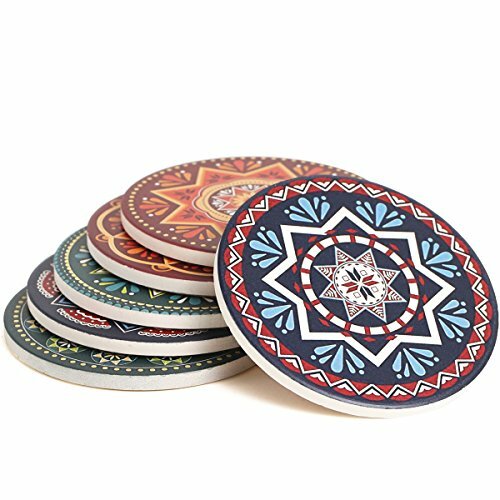 This set of 6 Mandala Design, absorbent, coasters with cork backing does NOT include a coaster set holder. However, we offer a coaster set holder for purchase separately at a discounted price when purchased with coasters. See the offer section for more details. To remove stains on coasters from spilled beverages, soak coaster in 1 part household bleach and 3 parts water until stain lifts, then rinse and air dry. HIGHLY MOISTURE ABSORBING - Absorptive material means it never has a puddle of water left behind and glasses don't stick when they're wet like they do with other coasters. You and your guests can enjoy party without worrying about excess condensation from cold beverages, Whiskey, Cocktail, beer... Isn't it assuring when put a glass of icy water on your wooden side table or nightstand on a hot summer night, knowing they won't leave a moisture ring on your furniture and damage it? 6 DIFFERENT MANDALA STYLES - This tableware is constructed with decorative transfer print. They can be used as home & office decor, barware set, bar service mat, bartender supplies or table pad. The cork mat on the back makes the coasters stay put without sacrificing their appearance. If you have any questions about this product by Enkore, contact us by completing and submitting the form below. If you are looking for a specif part number, please include it with your message.